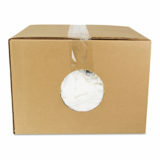 Reusable rags are vacuum-packed in a heavy-duty polybag/brick. Cut-up T-shirt rags are great for general-purpose tasks. Bleached white.